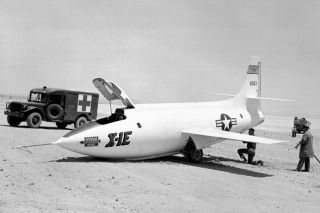 In June of 1956, Flight 7 of the X-1E suffered another nose gear failure on Rogers Dry Lake bed. In this historical photo from the U.S. space agency, Flight 7 of the Bell Aircraft Corporation X-1E is on Rogers Dry Lake bed with NACA High-Speed Flight Station test pilot Joseph Joe Walker at the controls on June 18, 1956. The first generation X-1s were well known for nose gear failures and the X-1E was no exception. The hard pitch down on landing usually resulted in a collapsed nose gear. The damage rarely was serious but required several days of down-time for repair.